Background ( © Performance Bikes 1992): Suzuki took a calculated gamble with the 250 Katana, In the land where today's blueprint is tomorrow's bog roll, a ten-year-old design doesn't seem a good idea. But the odds were in Suzuki's favour. When the original 1100 and 1000 Katanas appeared in 1981 the Japanese domestic market was throttled by a 750cc upper limit, with a stepped system of riding tests so draconian that most riders never graduated beyond a 400cc license anyway. The quarter litre Katana would be different: a chance for the Japanese biking public to own a bike they had built and lusted over but been forbidden to use. For optimum sales the 1991 Kat would have to be in the 250cc category the biggest market sector after the million-selling mopeds. This time the bike would be built for the Japanese not the Europeans. So what if it wasn't as fast as the original? It looked just like the real thing, and in Japan image is everything. The response was phenomenal, even for piranha-like Japanese consumers. A decade of pent-up desire quickly translated into a showroom stampede. within a month of its launch in May 1991, the 250 Katana became the best-selling bike on the market for four consecutive months. It isn't hard to see why. The original Hans Muth design still looks as fresh as it did at the Cologne Show in 1980. Jap PR-speak warbles on about how the design transcends time (Ed's note: considering the history of the motorcycle [100yrs] vs the history of the Universe [20 billion years] this claim cannot withstand even the most cursory examination) and makes some dreadful puns about it being on the cutting edge. But whatever they say, it looks the part from the tips of the needles on the contra-rotating clocks to the weld splatters on the tubular steel frame. 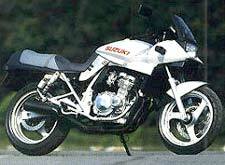 Looking at the engine, you would be fooled into thinking that Suzuki had even kept the air cooling, in these liquid cooled days. You would of course be wrong, it is a cunning illusion, with the engine straight out of the GSX-R / Bandit 400.